Battleground Fantasy Warfare has been around for quite some time. It's great for the minis fantasy player who doesn't necessarily want to deal with minis. In this Kickstarter, the Men of Hawkshold, the first faction for the game, is looking to get an update. There's new artwork. There's updated rules. It's got a bit of everything. Editorial: I love everything about this campaign. Just so you know going in. Charmed & Dangerous: The Sisters Grimm is a new tactical RPG card game that's up on Kickstarter now. It reimagines classic heroines and sets them out on adventure. You've got characters like Briar Rosa the Necromancer, Snow White the Ranger, and (my personal favorite) Gretel the Barbarian. Taiyo Dynasties - War of the Falling Petal will be coming to Kickstarter in May. 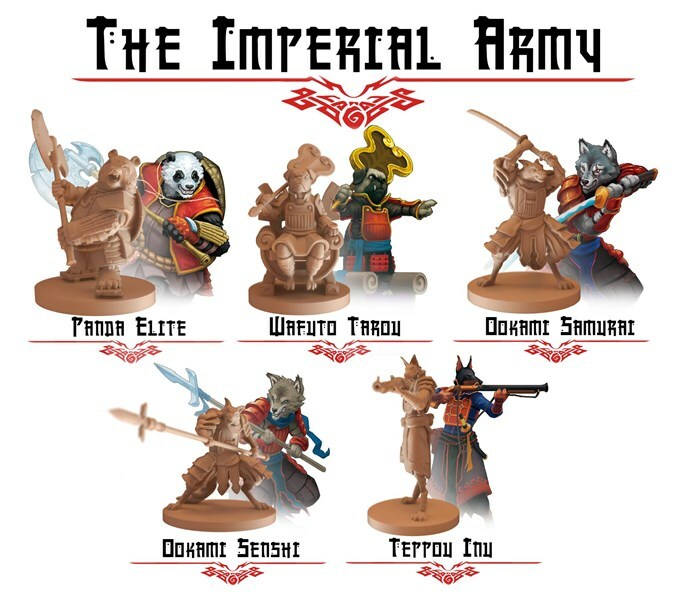 Ulfsark Games is showing off minis that'll be in it, including this look at the Imperial Army. Have yourself a look. The first two adventures for the Tyrant's Grasp Adventure Path are now available from Paizo. If you've ever had an adventure start with a TPK, this is the adventure for you. Unfortunately, the characters have already lost, but that's not going to stop them from figuring out a way to still win in the end. The thing with adventuring with low-level parties is that it can feel like the GM really has to bend the rules to make sure it's not just a TPK every time someone rolls initiative. Hamlet of Heroes looks to help, as it's a whole extended supplment of low-level adventures that your players can go on. The book is up on Kickstarter now. Monsters. They're a staple of most RPG games. You've got your adventuring party. They find out about some monster terrorizing the local populace. They go out and fight it. If you're having trouble coming up with monsters for your party to fight, and locations for where they can have said fights, you should check out Fearsome Foes: And Where to Fight Them, a new book for 5th edition up on Kickstarter. If you want to fill your day with gaming information, a gaming magazine can certainly help with that. Broadsword Magazine is one dedicated to all things 5th Edition, with new content monthly. If you're looking to join in, they have a Kickstarter campaign for it up and running now. There's just a ton of stuff over in Games Workshop's pre-order page right now. Some of it is still from last week, including the various Chaos figures they had. 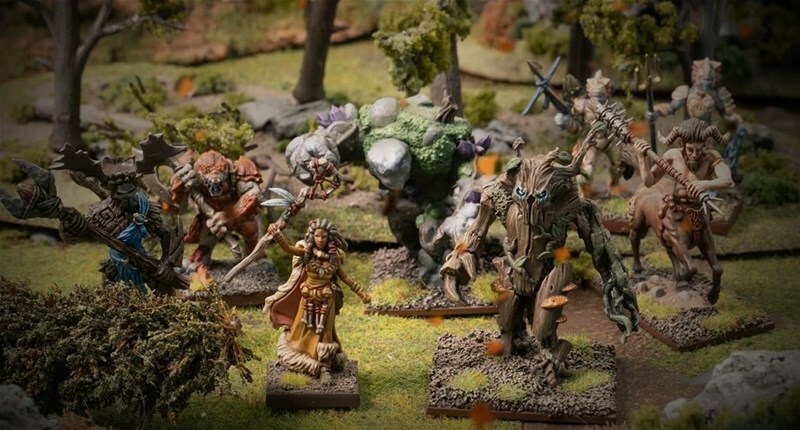 But there's also plenty of new things, like new Nightvault expansions, a whole bunch of figures for the Middle-earth Strategy Battle Game, and some returning items that are getting another release, like a book for said Middle-earth Strategy Battle Game and Adeptus Titanicus. Everything that's old is new again. While lots of new games keep coming out daily, there are those that long for the classic rules sets. And that's what we've got here. Old-School Essentials ties in perfectly with "Basic/Expert" games from 1981 (for those that remember those). The new rules are up on Kickstarter now. The Bloodstone of Targun is a mystical, magical stone, revered for its life-enhancing properties. The party has been asked to get it back out of the Mirefen bog. However, the local frog people have decided they don't exactly want to give it up. That's the story behind Descent into Mirefen, a new RPG adventure for 5th edition that's up on Kickstarter now. Civilizations all over the world have their own sets of myths and legends. And while some seem to get all the focus, there are others that are equally as rich and fertile to draw inspiration for a fantasy setting for your Dungeons & Dragons games. In this instance, we're headed to Korea with Koryo Hall of Adventures. It's a new camapign sourcebook that's up on Kickstarter now. 500 years ago, the Dragonlords and the Titans fought a massive war which concluded with the Oath of Peace. But, since then, that oath has weakened, and a new battle is on the horizon. You are the prophsied ones who will bring it to its conclusion. But will you survive? That's the story behind Odyssey of the Dragonlords, a new 5th Edition adventure that's up on Kickstarter now. Growing up in Chicago, Lage Geneva was just this place that family members would go to when they wanted a bit a luxury getaway. Little did I know that while I was playing soccer and obsessed with G.I. Joe, Gary Gygax was there in Lake Geneva, creating the foundations for Dungeons & Dragons, and in doing so, creating what would become part of my future job. If you're interested in going to see the Gygax home and all of the other gaming-historic spots in Lake Geneva, Geek Nation Tours is headed there. But you'd better get your ticket soon, booking closes on the 1st of May. I know, having a pdf of a book is nice. They're a bit more portable. They might have searchable indexes. All that stuff. But... I still love the print version more. It's just me. If you're also like me, and you're a fan of the Conan RPG, you'll be happy to know that Modiphius has released the print version of Horros of the Hyborian Age book. The Blackest of Deaths looks to be the Dark Souls of RPGs. Your character will die, and do so regularly, all the time, at every turn. But that just means that when you succeed, it's all that much greater a success. This new dark RPG is up on Kickstarter now. Sometimes it can be hard to find adventures for low-level RPGs. You've got lots for characters from 4+ and such, but what about when you're literally just starting a campaign? The Exodus of Wolfbane is an adventure for 0-2 level characters. So you've got that going for you. All of us were new gamers once. And many of us still play with new gamers from time to time. And, let's face it, something like Dungeons & Dragons can be confusing for a new gamer. Thankfully, there's those out there that have created guides to getting a new player up to speed as quickly as possible. Kort'thalis Publishing has created such a guide with their Crimson Dragon Slayer D20 guide. You can pick up your copy now. It's free, so why not check it out? You're just hanging out with your buddies at work. You've got things going well. When some group of murder-hobos come in and start stabbing everyone! How rude! Sure, you might be a minion of an evil entity, but still, that's just mean. Best to create a good defense. That's what you'll be doing in For the Dungeon!, a new comedy RPG that's up on Kickstarter now. Trollish Delver Games has released Dungeon Nights, their new adventure RPG that brings things back to an older time. It's a game with an oldschool feel, but with modern rules insights to create a new, retro experience. You can use it on its own, or plug it in to any OSR game you might be planning or playing. While I'm a "book in my hands" kinda gamer, I certainly also like having digital versions around so I can check things in the rulebook whenever I need. So, while I've got the physical versions of both the Official Movie Sourcebook and Haunting of Equestria for the Tails of Equestria RPG, I'll probably pick up the digital versions, too, which are available now.